AKB0048 2 ~ DES Attack! The DES try to stop the music. 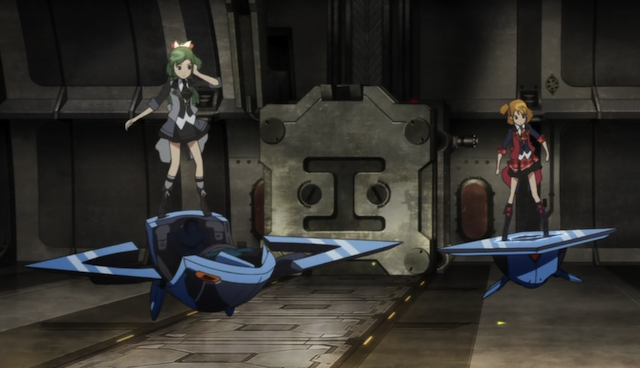 In episode 2 of the idol action adventure series of the season, AKB0048, the hopeful recruits meet some new friends, but their cruiser is attacked. Also tensions between potential rivals threaten to break the group apart. Who is that mysterious kid? And where is Chieri? OMG! That mysterious kid was Chieri! The three girls who are traveling to audition to be AKB0048 interns met up with several other girls that are doing the same. With that many Idol candidates in one place, an attack by the DES can’t be far off can it? 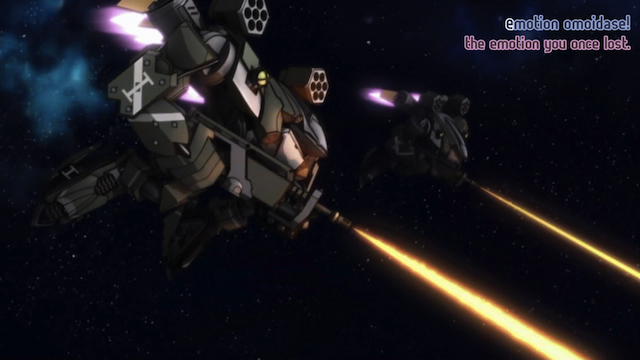 The DES launch a deadly mecha attack in an attempt to prevent the girls from making it to their audition. 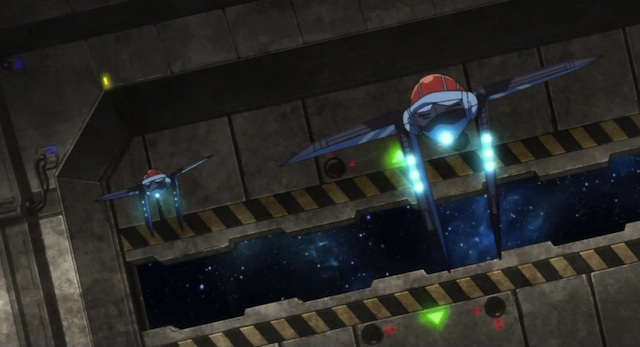 Fortunately AKB0048 management has already launched the Flying Get. 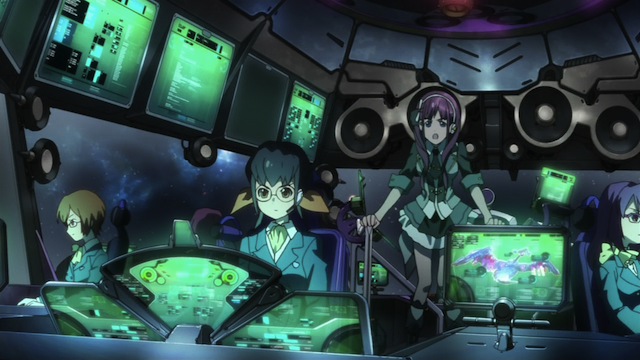 AKB0048 have taken over the ship’s intercom! 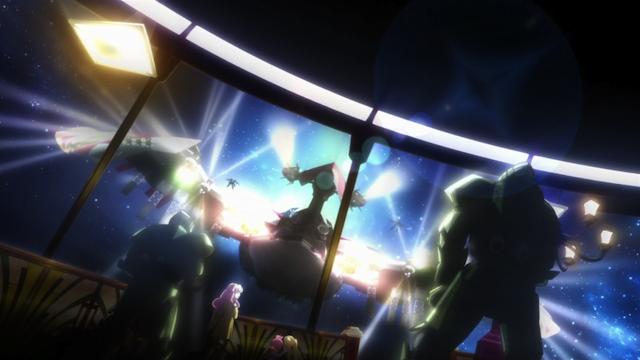 From inside an AKB0048 battle platform during a dogfight. Later on we get to see how the platform transforms and a little bit of the user interface. What’s more dangerous than a teenaged girl? A teenaged girl with a rocket launcher embedded in her arm! The platform on the left has just started to change. A clear view of the inside of the cockpit, before transformation has completed. 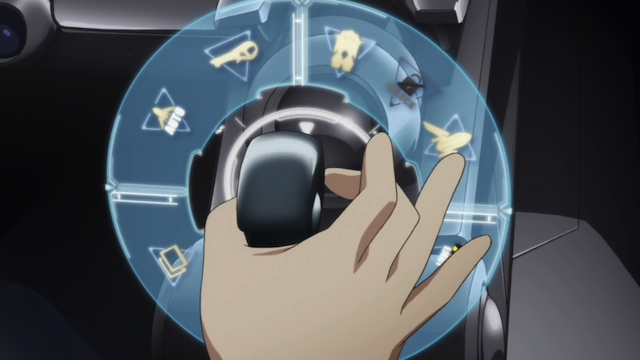 AKB0048 battle platform control system – 1. in the locked position. 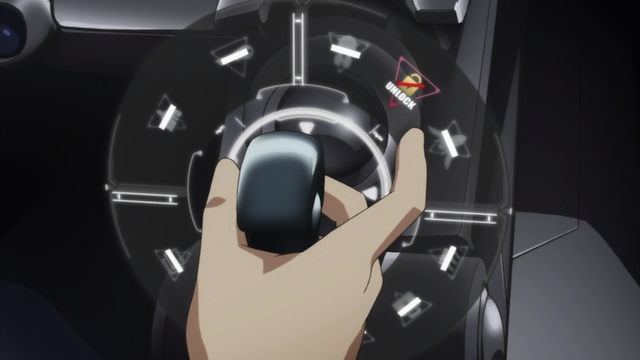 AKB0048 battle platform control system – 2. with control wheel activated. After the cockpit lid closes, the edges of the platform spin to become wings and rudders. Transformation complete. The battle platforms are now ready for space flight. Looks like a lot of fun. I wouldn’t mind having one myself. 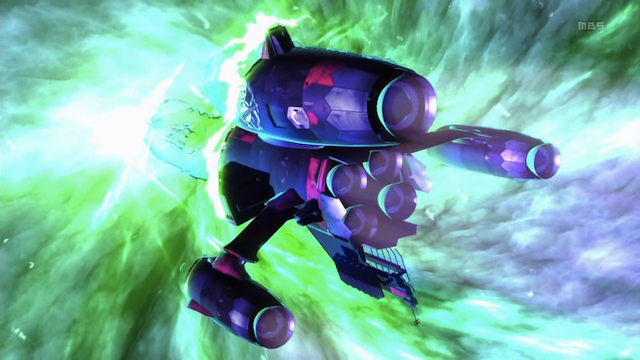 The Flying Get is about to commence faster-than-light travel. 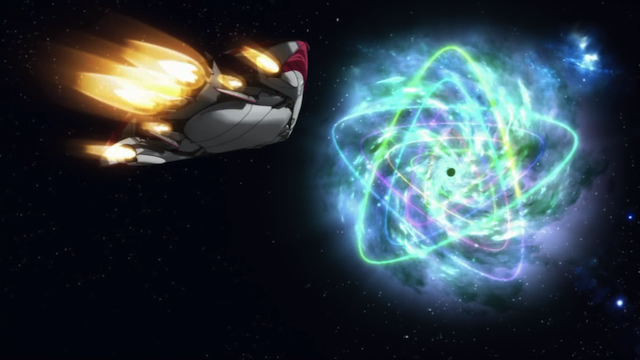 I like seeing how shows visualize FTL travel. It is really more of an imaginative thing that looks cool than anything else, since nobody knows what it would look like if it were possible. 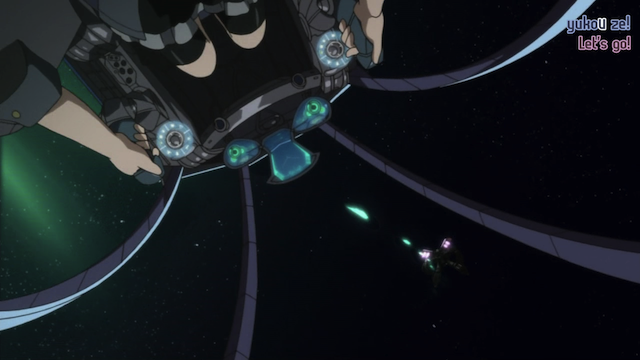 Here is how Mouretsu Pirates depict it for comparison. 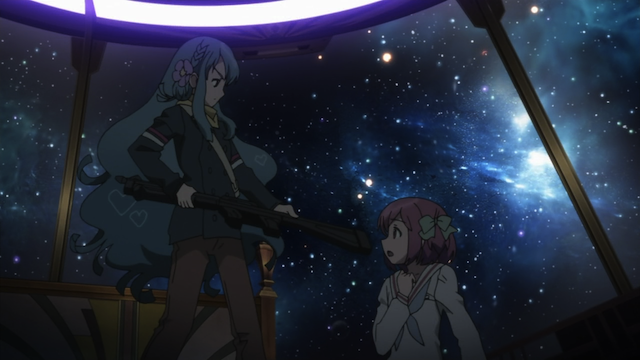 The AKB0048 version is heavy on design style, very geometric, and doesn’t look particularly natural. This seems appropriate in a series in which people have heart-shaped reflections in their hair and eyes. 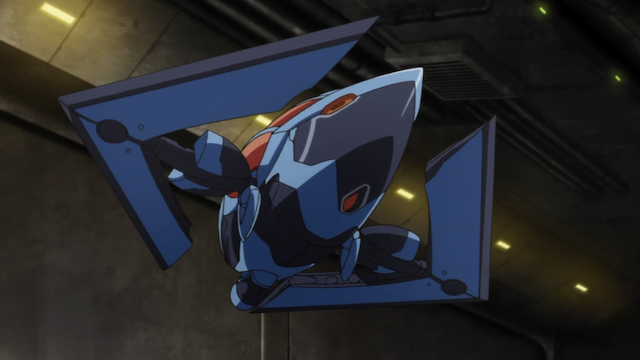 The ship is called “Flying Get”! I wanted to cry ;A; So perfect, and Tamura Yukari did such a good Mayuyu voice!!!! 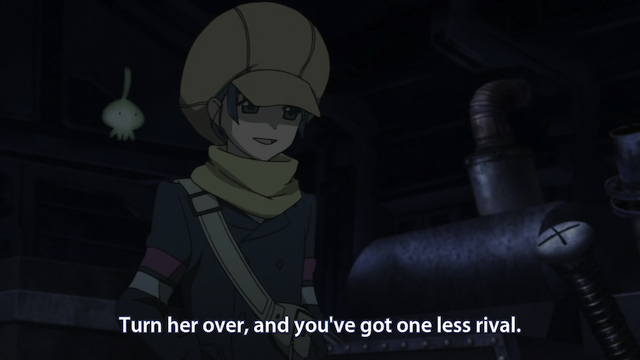 , ironically the actual Mayuyu’s voice acting was meh. And then they start playing AKB Sanjou! and I’m like dead. Oh my god so much AKB songs and references (and its only episode 2). This anime is so perfect. 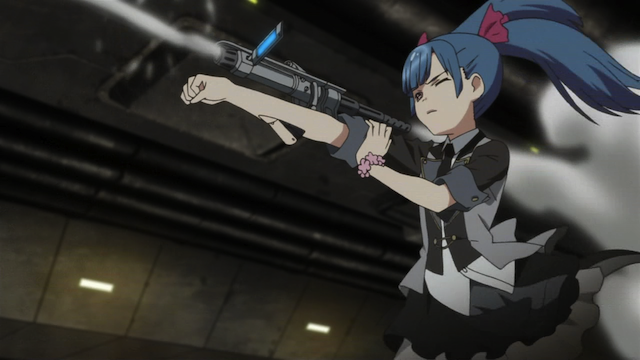 I’ll be honest, I really didn’t expect this anime to be this good. I liked the second episode better than the first, which is a good sign. “Flying Get”, “Maximum Rotation”, plus the idea of naming the 00 members after AKB original members was a clever idea. 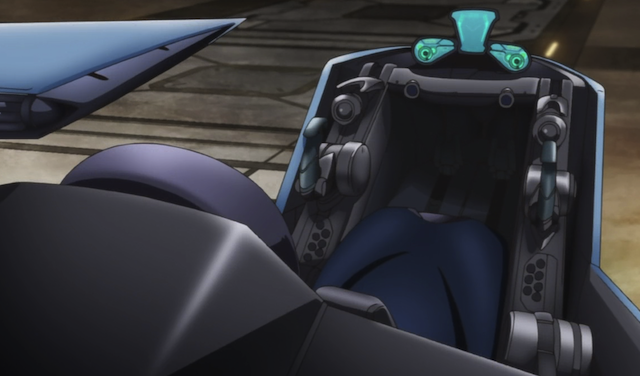 The action sequences are pretty well done.